October is Breast Cancer Awareness Month. Did you know that mammary (or breast) tumors are common in dogs and cats? They’re usually detected when a caregiver feels a mass on the pet’s abdomen. A fosterer for Midwest BREW [Beagle Rescue, Education and Welfare] noticed that Toffee, a dog in her care, had just such a mass. The tumor was removed, and it was cancerous. Fortunately, the disease had not spread, and Toffee is now cancer free. 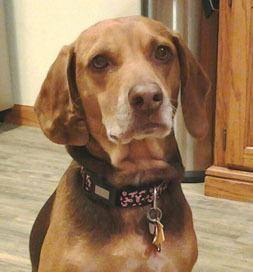 Penny stands proud in her “pink ribbon” collar to support breast cancer awareness. Anita and Neal Good of Celina, OH, had decided to open their home to a second rescue dog to keep their dog, Rudy, company. Anita began searching for a Beagle on Petfinder. The Goods changed Toffee’s name to Penny. Penny is “a dainty little thing; she prances like a little deer,” Anita says. “I painted her nails because she is such a diva!” No doggy beds for this princess; she sleeps with Anita and Neal, often bringing with her a piece of Neal’s clothing or a slipper to sleep upon. Finding a mammary tumor is easiest when pets are “lovebugs” like Penny, liking to be touched. A palpable mass on the abdomen is how mammary tumors are usually detected. The risk of one is much lower for spayed dogs, and cats of either gender, according to the American College of Veterinary Surgeons. In female dogs, 50% of mammary tumors are benign and 50% are malignant. Few are fatal in dogs. Malignant tumors in cats are more aggressive. Early detection is critical. “I am so glad Midwest BREW and her foster mom did not give up on her.” These days, Penny sports a collar and leash with the pink ribbon symbol of breast cancer awareness on them. “We proudly wear our pink together,” Anita says. Read more about how spaying reduces the risk of mammary tumors in pets.